Did you miss your chance to grab Oracle of Seasons while it was available at a discounted price on the 3DS eShop? Now you can experience (or re-experience) the game totally for free by pre-ordering a copy of A Link Between Worlds for 3DS at your local GameStop. Oddly enough, customers will not have a choice between which Oracle game they desire to download. The offer only stands for a download code for Oracle of Seasons; however, fans can still purchase Oracle of Ages from the 3DS eShop for a price of $5.99 USD. This offer has only been confirmed for the the United States as of now (where this poster was found), but we will keep you posted if we find out more information. 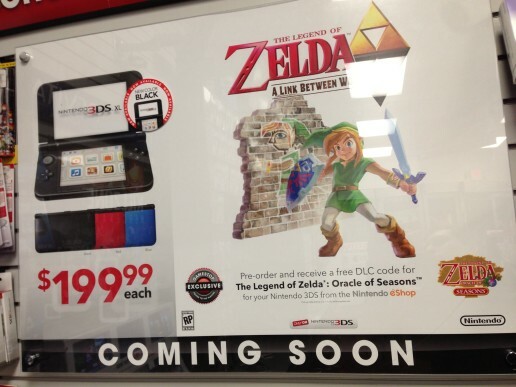 It should also be noted that this promotion is currently only available through an in-store preorder. Online customers will not currently receive this offer.